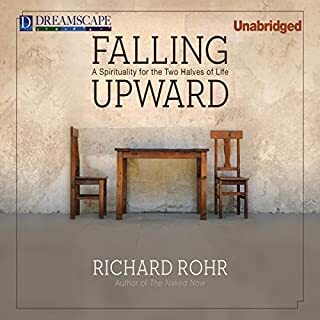 Where does Falling Upward rank among all the audiobooks you’ve listened to so far? 95% for performance; 100%, or top of the list, for content. What was one of the most memorable moments of Falling Upward? I loved that the author was reading his own work. Hard to say what the most memorable moments were. I am not sure Rohr could have done better, as his way of reading seemed ingrained. He often hesitated in places where a sentence should have flowed smoothly, and this interfered, in a mild way, with what he was trying to say, though only for a moment. However, his pauses made me think, and thinking is not necessarily a bad thing! In addition, Rohr's hesitations added a kind of charm. I loved that he read his own work and figured his hesitations were due to a slight discomfort with reading aloud, or perhaps due to a slight dyslexia. If this were a story with a plot, I could answer this, but Rohr's book is not a story. The entire book moved me deeply and has had a very positive effect on my life. Rohr's voice is restful and lends itself to contemplation and calm. I often listen to audio books when I can't sleep, and if a reader is too "wired" or intense, or if he or she speaks too fast, I don't listen. So I thank Mr. Rohr for both his amazing ideas and for his delivery, including his hesitations while reading.